GUELPH, ON (July 07, 2011) – Grain Farmers of Ontario announces the initial payments for the 2011 pool program. These prices are based on current market conditions and represent an estimated 65% of the final price. 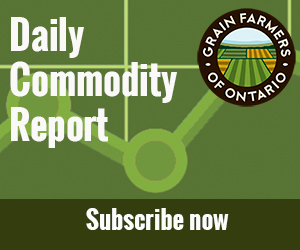 “GFO’s pool program allows farmer members an opportunity to diversify their marketing risk during these volatile times.” Barry Senft C.E.O Grain Farmers of Ontario. In the past 7 years, five of those have paid more to pool participants than the cash price market available at harvest. Please refer to the variety list on our website (http://www.gfo.ca/Marketing/WheatMarketing/InitialPayments) for the varieties accepted for Pool C (HRS). All varieties not accepted in Pool C (HRS) will be considered Pool F (HR). Please remember that Grain Farmers of Ontario requires a Form 7 producer declaration for all Pool B (HRW) and Pool C (HRS) wheat. * Effective July 1 2011 every producer of wheat shall pay to the local board licence fees at the rate of $0.87 per metric tonne plus the Grain Financial Protection Plan fee of $0.10 per metric tonne, for a total of $0.97 (includes 10 cents for Grain Financial Protection Fund) per metric tonne, in respect of all wheat marketed by the producer.